When we’re talking office phone systems, there are a lot of choices on the market these days. Technology has certainly moved on from the days when the office telephone system was a single hard-wired device with a spaghetti-like cord and circular number dial. Nowadays, a lot of business phone systems operate with the help of the internet and integrated automated answering services. 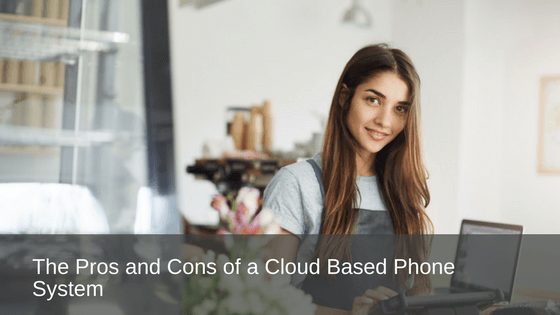 There are so many business phone system options out there, so we’ve done some homework and come up with a few pros and cons of the increasingly popular cloud-based phone system that you might find helpful. Putting the cart before the horse, what is a cloud based phone system? A cloud-based phone system is arranged whereby all of the programming components required to run your phone system are set up in the cloud. This replaces physical bits, that you would normally see within a phone closet and are operational requirements for the non-based cloud systems. The cloud-based system is operated and maintained externally by your service provider. So, let’s get the bad news out of the way first. What are the negatives of a cloud based phone system? As you have no access to the hardware, if the phone system crashes you need to rely on your service provider to rectify the problem, and that all depends on how promptly your service provider acts. Your phone system is reliant on the internet. If your internet connection is lost, then so is your ability to make calls. The good news, however, is that the other, features of your phone will still operate, like voicemail and the automated attendant service. Some providers may charge substantially high fees to set up your phone system. As well as this, they also expect you to sign up to a fixed-term contract where early termination fees may be payable if you are not happy with the service they are providing. Not all providers have this arrangement, however, so be sure to check this out if you are considering signing on the dotted line. The voice quality of some inferior cloud-based phone systems may not be that great. And now, for the good news. What are the strengths of a cloud based phone system? If you need to expand your phone lines and directories, the cloud offers an easy way to do so. Traditional phone systems can often be a lot more expensive to buy and configure. Cloud-based phone systems are a very good option for expanding businesses and those who have staff that work remotely, or from other locations, and would prefer the convenience of a single platform for all. These cloud-based office phone systems also benefit businesses that require speedy access to new phone system features. The points we have provided offer a birds eye view of the system set up, requirements, and operational aspects, which seem to suggest a healthy list of conveniences. Need some guidance? At Prosum, we are experts in communication and technology solutions, we provide office phone system recommendations, including cloud-based solutions to businesses of all sizes, across all industries, right around Australia. With 50 years of expertise, no one knows technology and communication like Prosum.